A clear morning with no signs of any mist so after breakfast we took the MTR to Tung Chung, located at the end of the Tung Chung line. 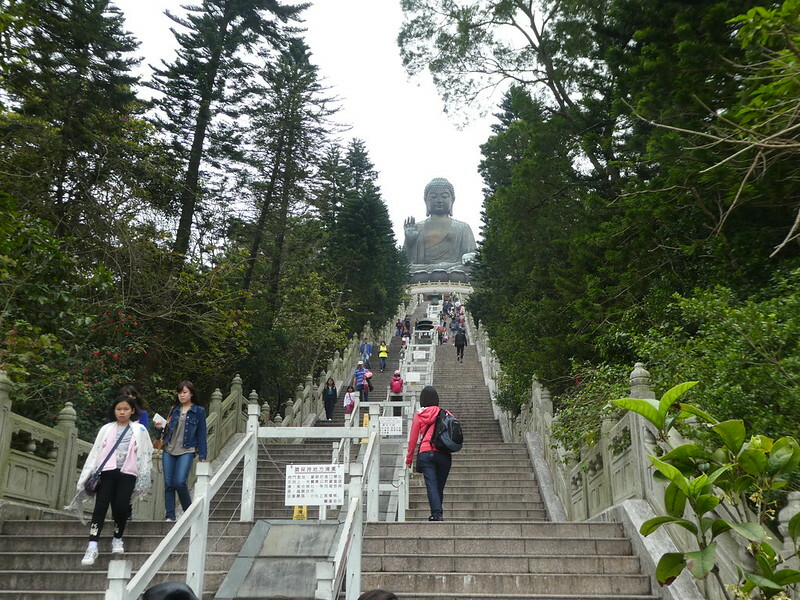 Our plan for this morning was to visit NGong Ping to see both the Big Buddha and the Po Lin Monastery. On recent visits I have travelled on the NGong Ping 360 Cable Car but we knew in advance that this was out of action until June as the ropes were being overhauled. A bus replacement was in operation, advertised as being outside the MTR station but actually located at the far end of the bus station, but still quite easy to find. Buses seemed to be leaving at regular intervals and we were able to pay for the journey using our Octopus cards. The journey was quite scenic passing through the Lantau Country Park as the bus wound its way up the mountain. Alighting from the bus we clambered up the 268 steps to the Big Buddha statue, also known as Tian Tian. After taking in the views we glanced in the exhibition hall located in its plinth. Returning down the stone staircase we wandered over to the beautiful Po Lin Monastery and quietly observed worshippers lighting incense sticks of various dimensions, their intoxicating scent filling the air. Strolling through NGong Ping village feral cattle were wandering around and one tourist who had placed her bag on the floor whilst taking a photo, turned round to find the cow had removed her packed lunch! 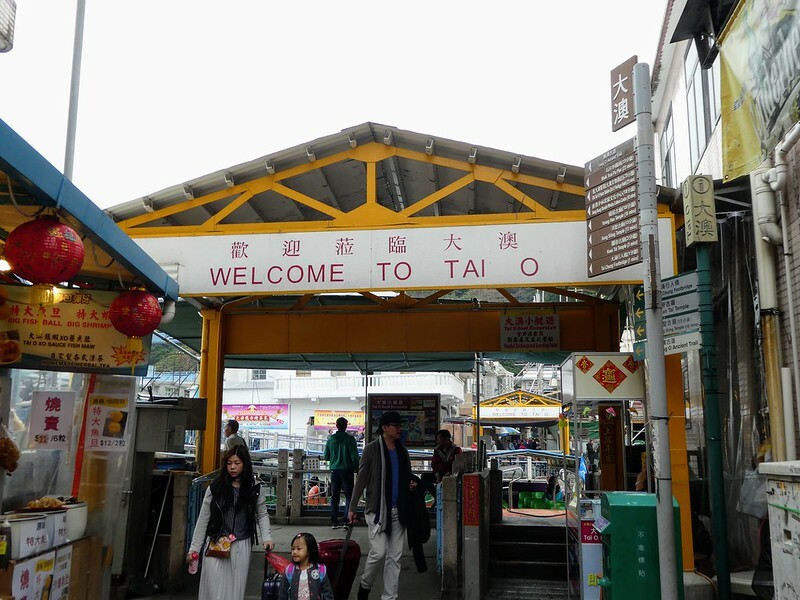 Moving on, we took Bus 21 to Tai O village, 15 minutes away. This bus only operates hourly so it’s best to check the times in advance to avoid wasted time standing at the bus stop. This service is operated by the New Lantau Bus Company and card readers are installed enabling payment by Octopus cards. 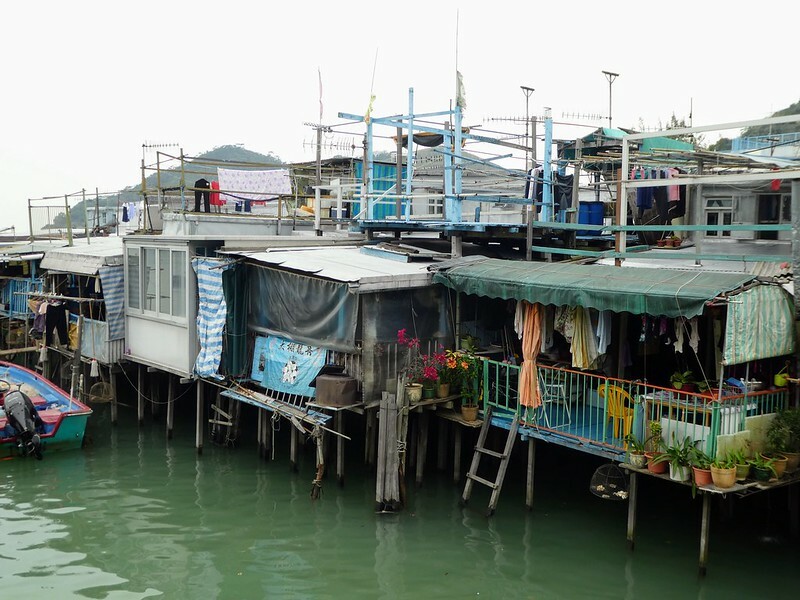 Tai O village is built around a creek with homes built on stilts over the water. It’s very picturesque and far removed from the ultra modern life in Central. Several companies offer boat trips along the creek and then out of the sheltered harbour in search of dolphins. Prices vary but all tours seem to take the same route and last approximately 25 minutes, our boat trip cost HK$20 each. Boats depart when there are sufficient numbers of passengers and we were fortunate to board first and take the single front seats on each side of the boat and only have to wait a few minutes until several other tourists joined us. Sadly, no sign of dolphins today but a pleasant boat trip nonetheless offering us a different perspective of the village from the water. 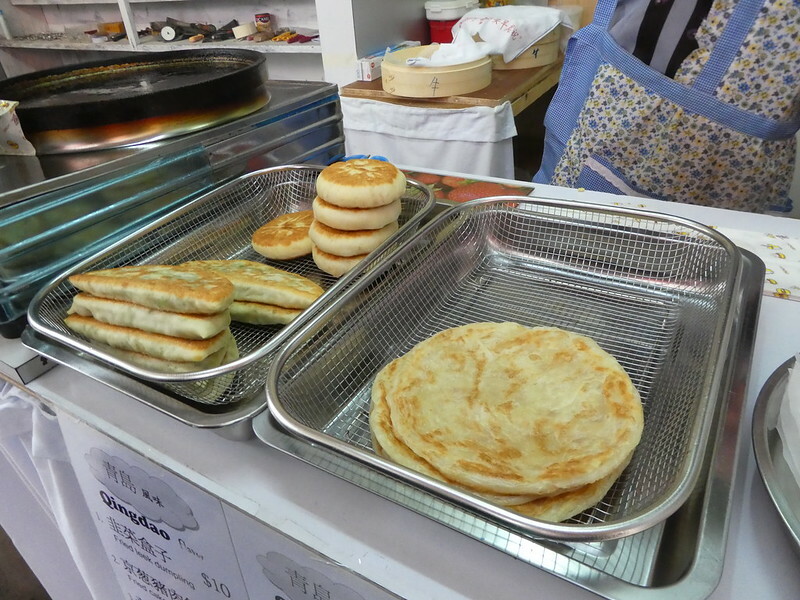 Feeling peckish, we bought some pork dumplings and leek and pork pancakes from street vendors, finding a bench in the main square to sit down and enjoy our lunchtime snacks. Feeling re-energised we wandered along more of the narrow village lanes, the aroma of dried fish filling the air. A further bus journey to Mui Wo (Bus No. 1) taking 40 minutes brought us to the ferry terminal and with 20 minutes to spare we had time for a cup of coffee and McDonalds seemed to be the only option. Our round trip concluded with a one hour journey on the slow ferry back to Central. If you take this route I suggest sitting on the upper deck at the right hand side of the boat for some excellent photo opportunities when passing Kennedy Town and approaching Central. We then popped into the IFC mall for a little window shopping and whilst there, we used the free wi-fi to check-in for our upcoming flight to Taipei in 48 hours time. Cathay Pacific now charge for pre booked seats so it’s a good idea to try and check-in and select preferred options as early as possible. We had no trouble selecting the window seat and the one next to it in a good position on the aircraft. Returning to our North Point hotel we again bought coconut buns and warm egg custard tarts to take back in with us for afternoon tea. 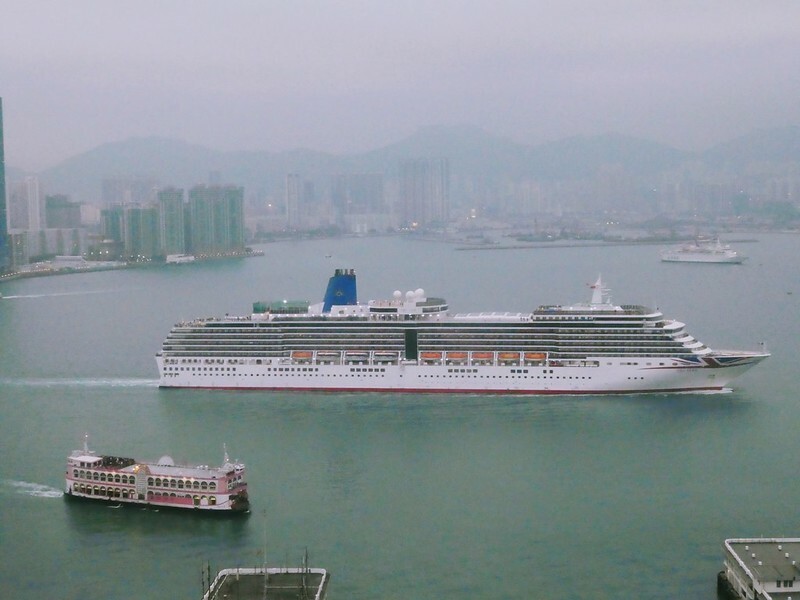 Back in our room, we saw the huge P & O. cruise liner Arcadia sail past our window and on looking up her voyage on our iPads, we discovered the ship was on a world cruise, now heading for Vietnam. After a little rest and a catch up with news on TV, we were off out again. We strolled along to Fortress Hill, glancing in shops along the way. Hung Hom Cafe looked inviting and as there was a short queue outdoors we thought it must be a good sign. Our meal tasted good and on leaving the restaurant we continued our walk all the way to Causeway Bay. 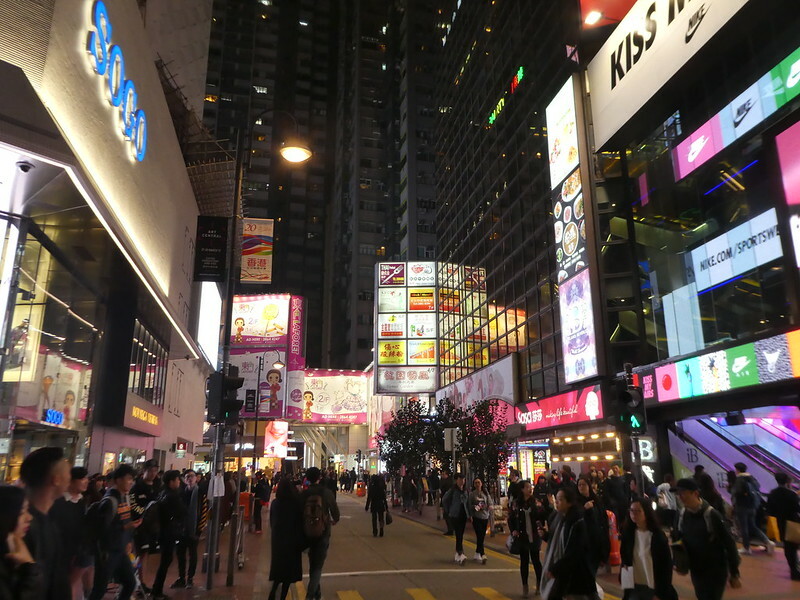 I always love the fast paced evening scene here with the bright lights of Times Square and Hyson Place still bustling with people shopping at 10.00 p.m. in the evening. We weren’t tempted into walking back so hopped on one of the lovely old ‘Ding Ding’ trams, sitting upstairs at the back for excellent views as we rattled along Hong Kong island back to our hotel for the night. Love Hong Kong. Spent a lovely 10 days there in 2008 and saw many of the same sights. Hope to get back there some day. Great pics. Thanks Richard for your kind words. Hong Kong is always a great place to visit and I hope you get a chance to return soon. 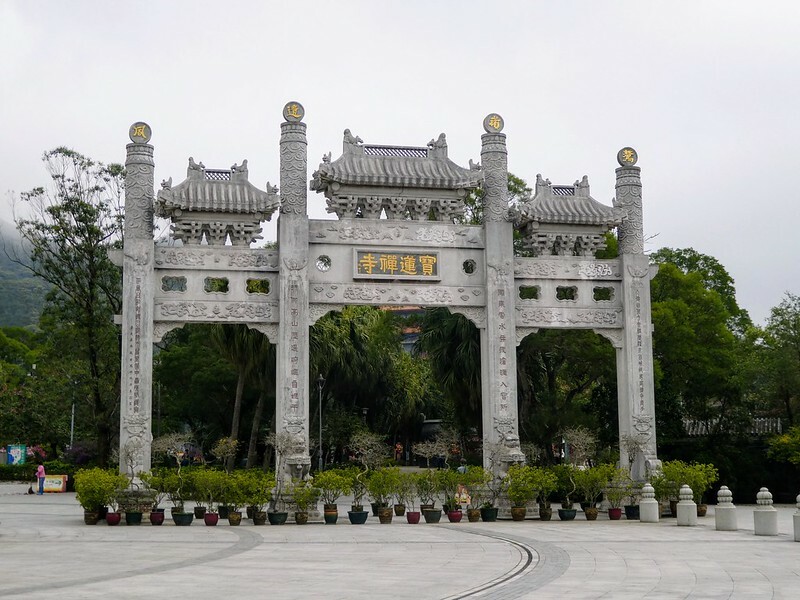 I was interested to read this as I visited Po Lin Monastery and Tai O village before the new airport was built. At that time, Lantau Island was so rural and the only way to get there was on the ferry from Central to Silvermine Bay followed by bus! I understand it’s a bit different today! It is now much simpler to get to these places with various options being available including the cable car. Thank you for taking the time to read this post and for your comments. What a wonderful trip! I’d have loved seeing any/all of this but seeing the big Buddha was super fun-thanks! Perhaps you’ll get an opportunity to visit one day but until then thank you for reading my posts and for your welcome comments. Looks like another wonderful day! 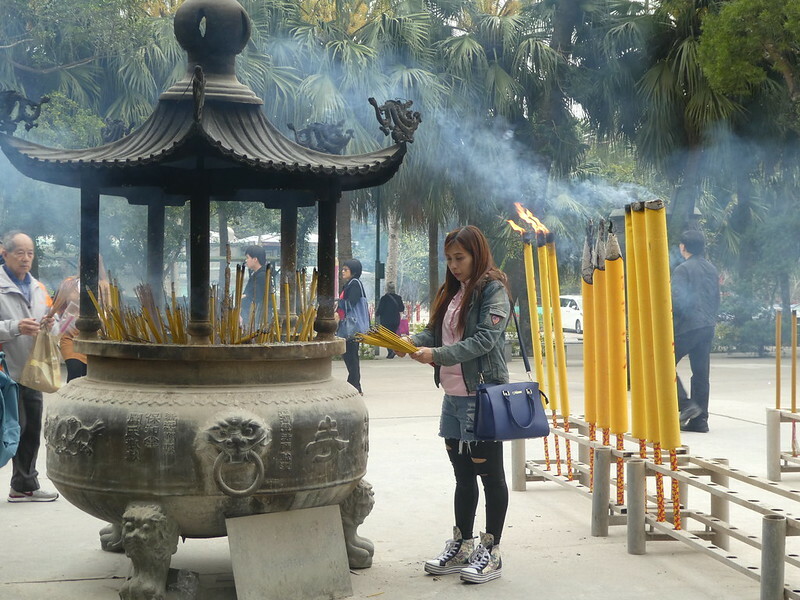 Some of those incense sticks were humongous! I don’t think I would have been able to stay there long because incense tends to make me sneeze and gives me a headache – at least all I have smelled around here. That’s a coincidence as incense makes me sneeze today. Some of those sticks resembled fireworks. Thanks for your continued support to my blog and hope you are having a good weekend. Thank you Marcus. Hope you have a good weekend, hopefully with your family. M.
Another fabulous day Marion. I recall a wonderful cheap vegetarian restaurant at the Buddha which I went to a couple of times. Plastic tables and chairs but great food. Looks like you are some good dumplings she oancajes at the Village though. When we visited in the late 90’s we had lunch both times at that vegetarian restaurant but our most recent visits have been earlier in the day, but I remember it was good. Have a good weekend! Hi Marion. Glad you went too. Hope your weekend is lovely. Looks very familiar. Love the food in Hong Kong. I love the food there too. So much nicer than Chinese food that’s available here in the U.K. I noticed the same in the USA and Australia too. Unless you go into authentic Chinatown in one of the Western big cities you don’t get the same great taste of Chinese food or its close relative in Southeast Asia. The suburban Chinese restaurants modify their presentations to appeal to Western taste which spoils it all for me. That’s exactly how I feel about it too! Thank you for your much appreciated comments. Those homes on creeks were so interesting to see. It’s not every day you can say a cow ate your lunch! Great post. Thank you for your inspiring thoughts. I’m glad it wasn’t my bag the cow took a fancy to! You captured some great scenes. Thank you. Thanks Kevin for your kind words. So pleased you are enjoying my blog. Thanks for your good wishes Brick. A chance for you to eat more of those Pasteis de Nata too!! M.
Wow that Big Budha is huge – so impressive and that cheeky cow had me smiling!! The village on stilts looks really interesting too, shame about the dolphins but it sounded like a fun boat ride even without them appearing! 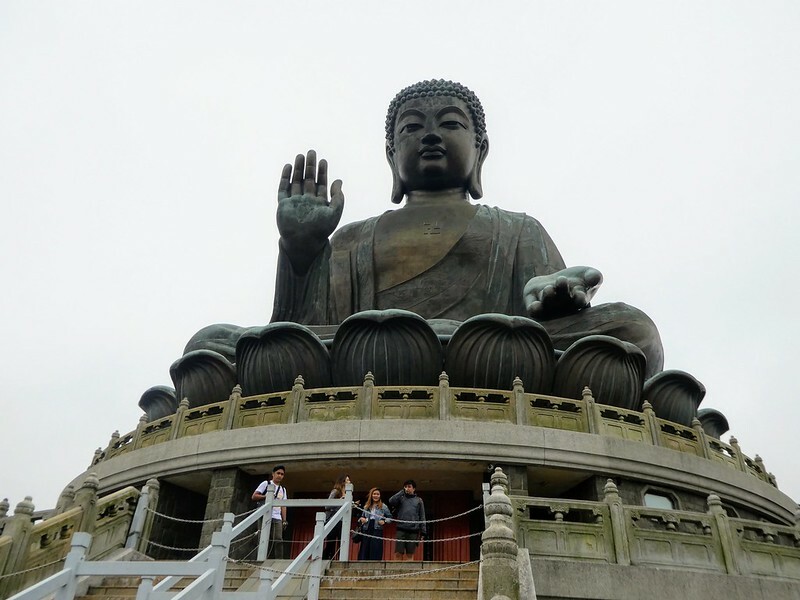 Visiting the Big Buddha is really interesting and the Tai O Village traditional village very photogenic. The cow made me laugh too!! Thank you for reading my post and for your kind words. I do hope you have an opportunity to visit Po Lin soon. Lovely post. It brought back memories of my visit to the Big Budda. We didn’t go to Tai-O Village so I was glad to see your pictures. It was so convenient getting around in Hong Kong by public transportation. Also a great way to experience locals’ lives. Thank you Keng for your kind words. 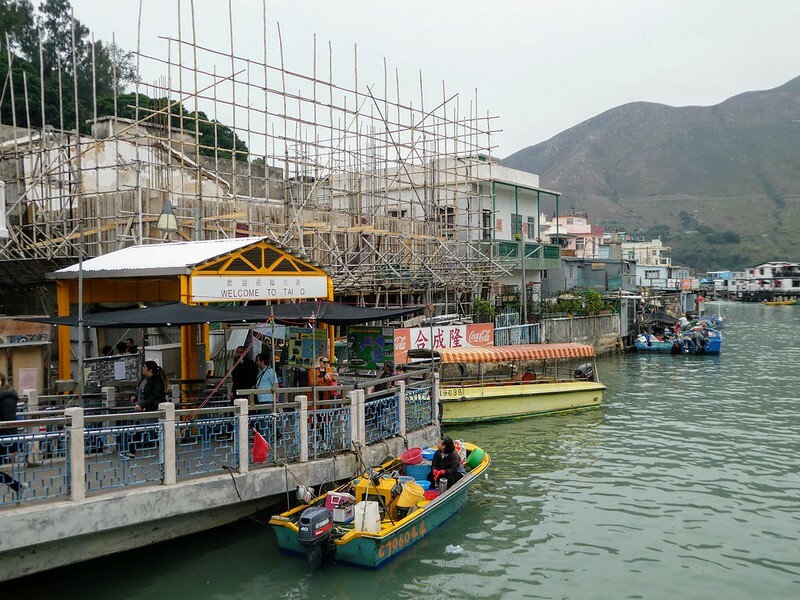 Tai O Village is really pretty and easy to get to by bus. We always use public transport as, like you, we get to experience life as locals do, it’s fun and of course it’s much cheaper. Thank you for linking my post and for taking the time to read my posts, it’s much appreciated. 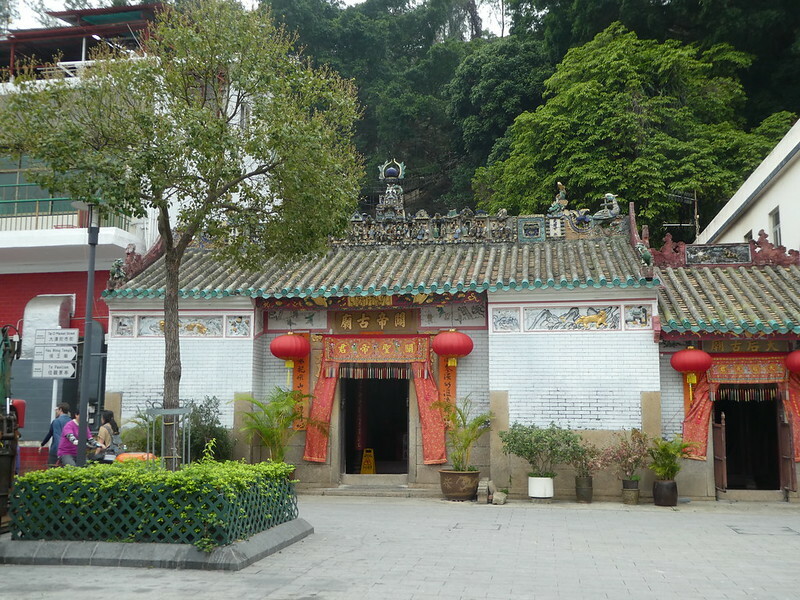 Hi If you have time while in HK visit the Chi-Lin nunnery. Well worth a visit, Diamond Hill, Kowloon. Thank you for your tip Pete. We did actually visit there earlier in the week but its kind d of you to mention it and for taking the time to read my posts. Thank you, we did indeed and thank you for taking the time to read, comment and reblog my posts, it’s much appreciated. Did you eat the big fish balls? We didn’t eat any of the big fish balls that day we did try them on a different day and they were delicious.